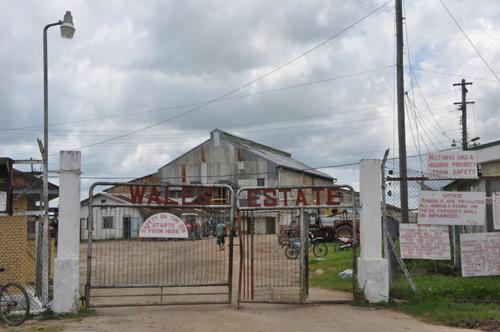 The estate worker of the Wales Sugar Estate, who died today after being struck by lightning has been identified as 17 – year – old Klein Roberts. The teenager was a member of the pest control gang at Wales. The Estate Manager, who was present at the time of the incident in the field, told Roberts’ family that they tried to assist the boy but his body was already lifeless. Roberts was taken to the West Demerara Regional Hospital where his mother Maxine Jacobs and other relatives gathered for confirmation of his demise. The woman said her son only started working on the estate three weeks ago. Klein Roberts leaves to mourn his mother, father and eight siblings. Meanwhile, at the Blairmont estate, lightning struck six workers who were all rushed to the Fort Welling hospital. However, the condition of one of the workers was said to be critical and he was rushed to the Georgetown Public Hospital for further treatment. Late this afternoon Guysuco’s Industrial Relations Director Jairam Pitam informed iNews that five of the victims were treated and sent home, while the one sent to the GPHC remains under observation, but in a stable condition. Meantime, Pitam said Guysuco will be meeting with Roberts’ family to discuss how they can be of assistance. He was able to confirm offhand though that the Corporation will bear the expense of the funeral. Over the past few days, Guyana has been experiencing lightning and thunderstorms, and this is expected to continue for the next couple of days. However, Pitam said Guysuco has not contemplated seizing operations because of this.